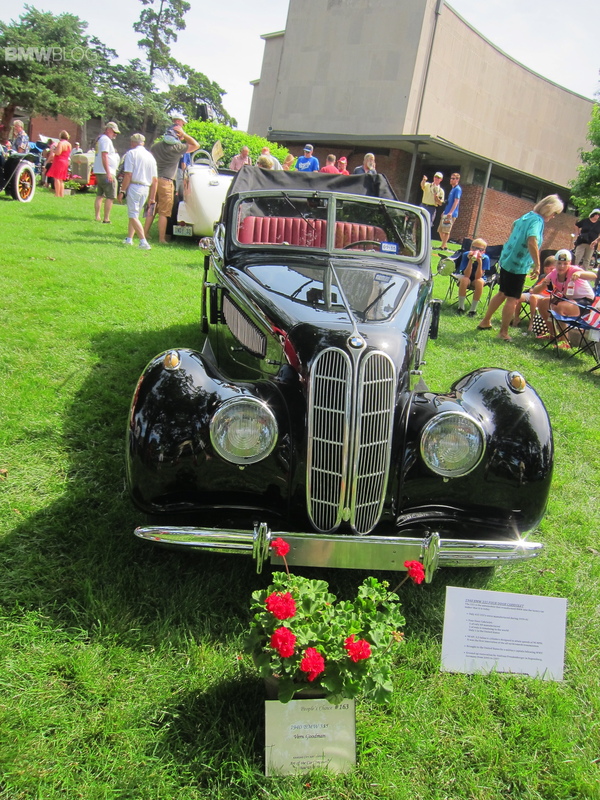 The eighth annual Art of the Car Concours was held on the ground of the Kansas City Art Institute on Sunday June 22, 2014. 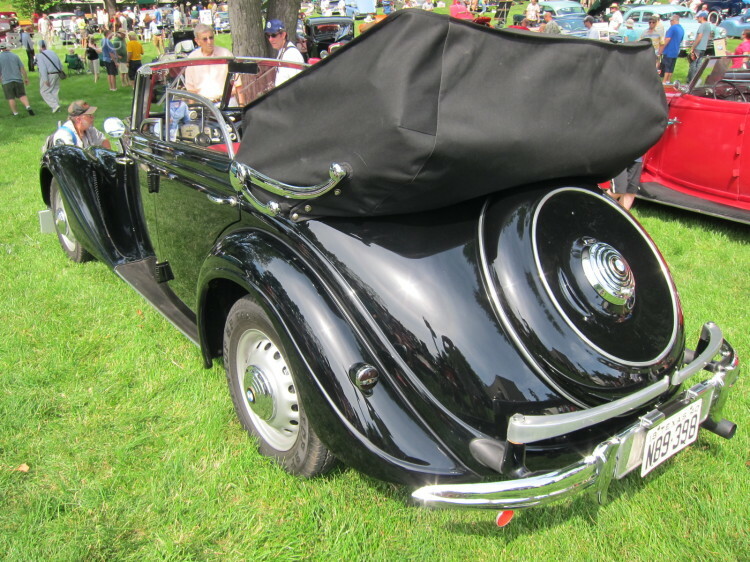 As usual there were a number of BMWs on display and this year there was a very rare treat, a pre-war 335 four door cabriolet, as well as a pair of post-war BMW Isettas. The 1940 BMW 335 four door cabriolet was built in the Eisenach works, and, most probably, bodied by Autenrieth of Darmstadt. It is one of forty four door 335 cabriolets built and now one of only six that have survived. It is a wonder the cars were even built since Germany was at war from September 1939. However, civilian production wasn’t banned but it had to fit into gaps in the production schedules of war material. There were 410 335s built according to BMW and while some believe more were constructed, there is agreement that the totals were under 500. In 1935 Germany repealed its displacement tax and manufacturers could plan for building cars with big engines – beyond an artificial 2.0L barrier – and BMW planned accordingly, designing the M335 engine. Responsibility for the design of the overall car was given to Fritz Fiedler, lately of the Horch automobile concern – he joined BMW when Horch was absorbed into Auto Union. The M335 engine was an overhead valve 3.5L (82mm bore/110mm stroke) and produced 90 HP at 3,500 RPM. It was a four main bearing engine, with intake and exhaust located on one side and spark plugs on the other. It was not dissimilar to the contemporary GM ‘stove bolt’ six. When power in development exceeded the target 90 HP they dialled back valve timing with a redesigned camshaft. The engine was designated the M335/1 in left hand drive cars. There were hopes, in the time prior to September 1939, that the 335 would be made available in the UK through BMW’s ties to Austin Frazer-Nash. And there was a version of the engine, the M335/2, which was slightly modified to be installed in right hand drive vehicles. The 335 also utilized a ZF four speed gearbox which featured synchronizers in all four forward speeds, something truly remarkable at the time. 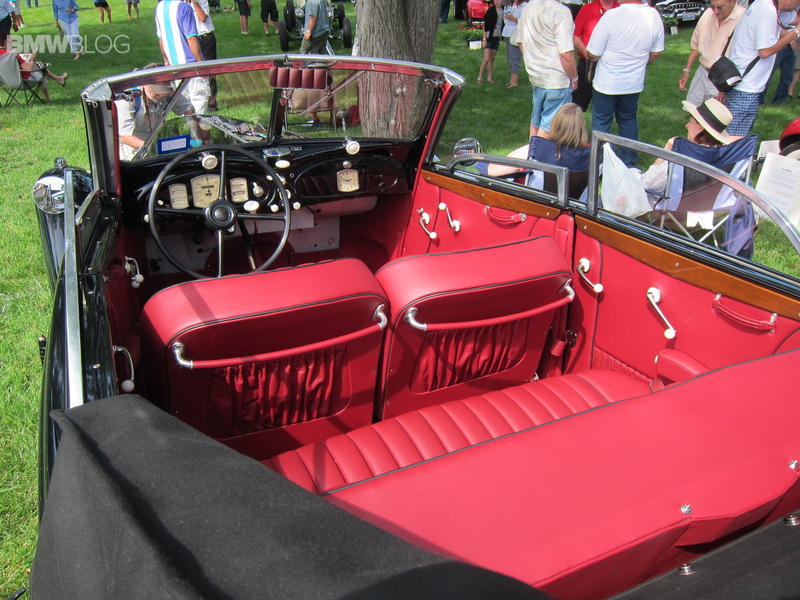 The 335 was purposefully luxurious, featuring an interior composed of leather, wood, and chromium. However, with the advent of war only buyers with access to what were known as ‘rote Ecke’, red corner, registration could purchase cars. And the owner would need to call in favors to purchase tires, since the 6.00 x16 rubber was not available for factory installation and the cars were shipped without tires. That this 335 survived the war is a miracle. After the war BMW, for all practical purposes, ceased to exist. The Munich factories had been cleared of rubble and put to use as repair depots for allied vehicles upon cessation of hostilities – BMW had to define a way forward when manufacturing was eventually allowed to resume. It was decided to concentrate on the high end of the automobile market with the Baroque Angels, margins would be better and numbers smaller, which enabled them to better control quality. But as time went on, and their motorcycle manufacturing arm did not deliver the returns needed to sustain the company, BMW needed to look for another product to build. Renzo Rivolta of Italy was involved in refrigerator manufacturing in Italy with a company that used ‘isothermic’ as part of its name. After the war Iso got into the scooter business and eventually built a three wheeled car, named the Isetta (a diminutive of Iso) and were fairly successful with it. However, the introduction of the FIAT 500 spelled trouble for the little Isetta and Rivolta started looking for licensees to take on production in other markets and hopefully keep some income coming in. 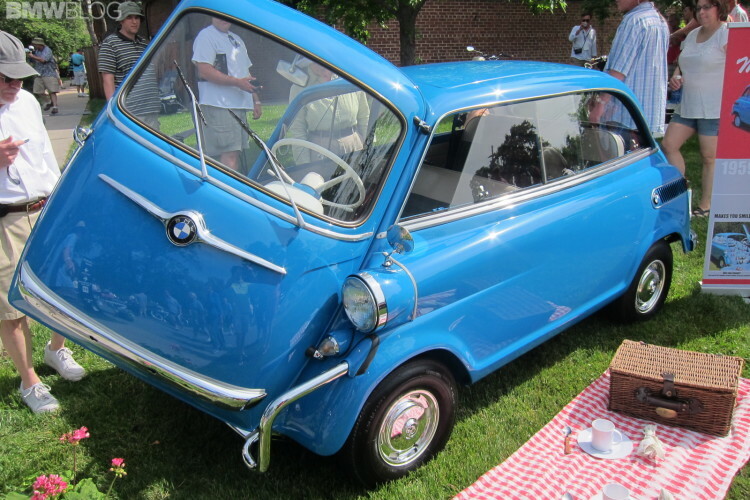 Enter BMW’s Fritz Fielder (again), who advocated for licensing, and BMW decided to produce the Isetta under license. They threw away the nasty little two-stroke motor Rivolta used and placed a single cylinder engine from the R-25 motorcycle in the 250. It was built in three and four wheel variants (taxation being an issue for the two versions). Eventually the single cylinder from the R-30 was dropped into the 300 model Isetta. The 250 was good for 12 HP, the 300 13 HP. 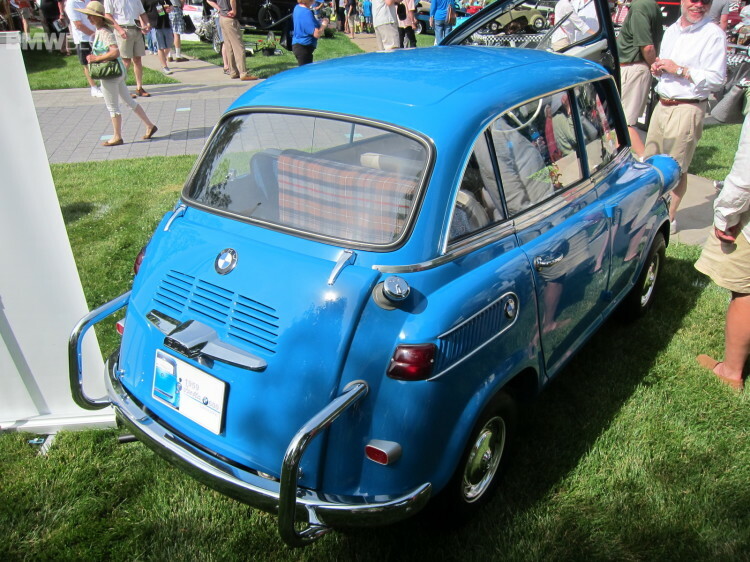 BMW was fortuitous in that the Suez Crisis hit about the time the 250/300 came to market and bubble cars became the rage as gas prices sky-rocketed.But as the crisis eased, and economic conditions in Germany continued to improve, the call for small cars declined. 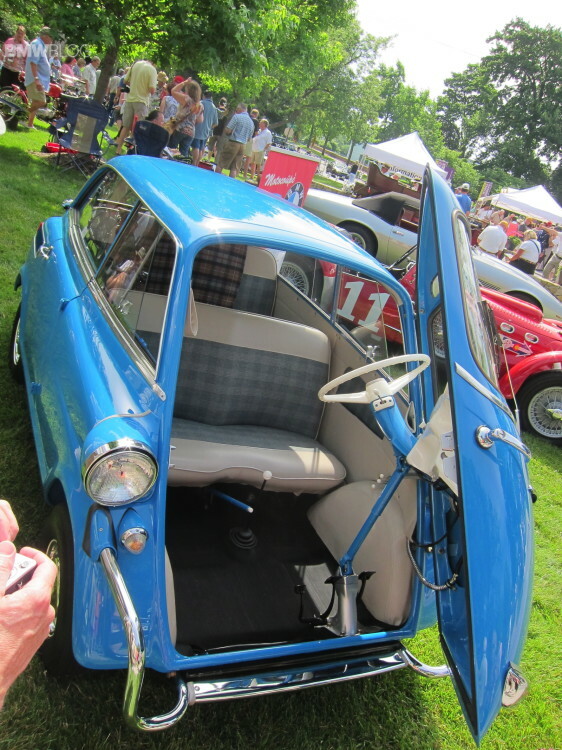 The 600 was a two door, stretched, variant of the original Isetta. Of course the driver entered via the front ‘refrigerator’ door but a passenger side (curb side) door now gave access to a second row of seats. The 600 also used the two cylinder boxer motor from the R-67 and, given the weight of additional passengers, sported a whopping 19.5 HP. There was, however, a hidden engineering gem in the 600. BMW decided to build what is, in German, called a ‘Schraeglenkerasche’ – semi-trailing arm – rear suspension. This would go on to be placed in other BMWs and was a definite improvement over the swing axle rear suspensions of its competitors. Of course the 600 gave way to the 700 and during this time the Neue Klasse cars were being designed. BMW almost was absorbed into Daimler-Benz in 1959, and if it were not for the promise of the next generation sedans and coupes, and Herbert Quandt’s foresight to purchase a majority of shares, BMW would have ceased to exist yet again. It is always a pleasure to see historic BMWs and to see them in the heart of America is a treat. Thanks to the exhibitors and the staff of the Kansas City Art Institute Art of the Car Concours for making these classics available.